Finn, Jake, and BMO are babysitting Sweet Pi while Treetrunks and Mr. Pig go on a romantic date. Sweet Pi does not remember his time as The Lich, but when he gets upset, his powers start to resurface. He nearly ends up destroying the house before Treetrunks comes home and scolds him, calming him down. Treetrunks treats the trio to some fondue but spots LSP hanging around outside. When she goes to investigate, LSP says she wants a map of the Ooo Badlands. Treetrunks is hesitant and says she’s left that part of her behind, but LSP convinces her otherwise. Jake overhears their conversation and ropes Finn and BMO into spying on their adventure. In the morning, Treetrunks sneaks out of the house and finds LSP waiting for her with a car. The two of them go off on a search for treasure that can both please LSP and cover costs to repair Treetrunks’ house. Meanwhile, Finn, Jake, and BMO follow them overhead. They spot the Zombie Twins heading after Treetrunks and LSP, and Finn jumps down to protect them. 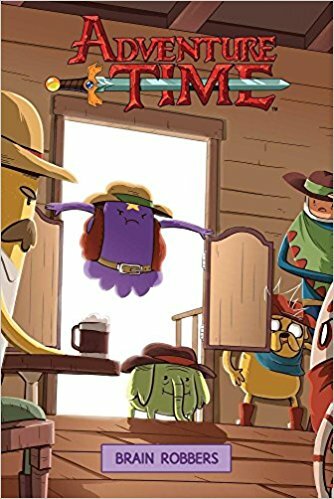 Since LSP and Treetrunks are busy discussing the beauty columns in Lumps Magazine, they don’t notice the fight behind them. LSP gets distracted by talking to Treetrunks and accidentally drives the car off a ravine. In the meantime, the Zombie Twins scalp Finn and steal his brain. Jake and BMO find Finn’s body and vow to recover his brain. With the car totaled, LSP and Treetrunks visit a nearby saloon to gather more information. The bartender recognizes Treetrunks from her old days and recommends her to go see the boss. The boss turns out to be Guildmaster, one of LSP’s old acquaintances that vowed to kill her when they both developed a crush on the same guy. She explains her backstory through song, which touches Treetrunks but upsets LSP. LSP says that she and Treetrunks aren’t friends and counters with a song of her own. Her singing is terrible and the crowd boos her off stage. Guildmaster is not impressed and throws them out, but Treetrunks challenges her to a round of arm wrestling. Treetrunks wins, and Guildmaster hands over her spare horses. Outside, Treetrunks asks LSP if she really meant that they weren’t friends, and LSP gives a half-hearted excuse. Jake and BMO visit the saloon too, but without much success. The Ice King overhears their plight and offers to tell them where the Zombie Twins live on one condition: they call him their friend. Jake reluctantly agrees, and they all head out towards the Twins’ hideout. Treetrunks has a dream that she brings home the treasure, but Sweet Pi regresses back into The Lich and starts to destroy her home. She wakes up, and LSP confesses that she had a bad dream as well. LSP says that she dreamed about when she dated one of the Zombie Twins. It worked out well at first, but when he offered her his tarantula farm she felt he was taking the relationship too fast and vowed revenge. They find the Twins’ hideout in an old train and meet the Twins’ roommate, Cameron. Treetrunks asks Cameron about the treasure, and if she could have some to save her family. Cameron sympathizes with her and shows the two his kids: tarantulas that he raised after they were abandoned by their parents. LSP realizes in horror that those are the tarantulas that she abandoned. Before LSP can digest the information, the Twins return. In the meantime, Jake and BMO arrive, and in their search to find the Twins, they accidentally reactivate the train. A fight breaks out, and Treetrunks has enough. She says that the adventure is too much for her, and what she really wants is to be happy with her family. LSP shouts out that she has an announcement, and tries to reconcile with one of the Twins. BMO then announces that he found the treasure: hundreds of brains. Unfortunately, they can’t figure out which one is Finn’s. As the Twins attack, LSP takes an attack for Treetrunks. The two reconnect and work together to fend the Twins off. LSP also praises Cameron’s job in raising the tarantulas well, but Cameron points out that the train is headed towards a cliff. BMO finds Finn’s brain and brings him back to life, and Finn decapitates the Twins. Cameron realizes in horror that the Twins were the only ones that knew how to operate the train. LSP, regretting her earlier actions, tries to save the tarantulas, but luckily, BMO and Jake carry the train to safety. The rest of the tarantulas hatch, and instead of feeling disgusted, LSP is happy. Treetrunks returns home and finds that Mr. Pig and Sweet Pi have repaired the house while she was away. Overjoyed, she decides to throw a party for everyone. Jake and Finn talk about their parents, for better or worse. In the middle of the party, Bubblegum realizes that the cake is actually made of brains, recycled by Treetrunks as a treat for Sweet Pi. The family shares a happy moment together, along with the baby tarantulas, which Treetrunks also adopted. The story mainly focuses on Treetrunks. We learn that she used to have a wild side when she was young and was an adventurer like Finn before she settled down in the woods. She gets to show off her skills as an adventurer on the road, and in rather unfazed by dangerous situations. While she may not be capable enough to handle everything, she is certainly more than fit to handle most things on her own. What brings her into the adventuring life, and later out from it, is her desire to help her family. She is concerned for Sweet Pi growing up and possibly reawakening as The Lich, because that would without a doubt tear apart her family. She also wants her family to live together in comfort, and be surrounded with a good community. Her entire journey isn’t for the glory of finding treasure like LSP wants, but because reselling the treasure will allow her to repair her house. As for LSP, she is her usual self. This story shows that she does have the potential to reflect on her actions and mean it, unlike most times where she apologizes begrudgingly. Her budding friendship with Treetrunks is also a pleasant read, since the two mesh together quite well. Overall, this adventure sheds some light on both girls and is a worthwhile read for fans of the characters. The story was a little too outlandish for my tastes, but it is a fun parody of Western-style adventures.